Shabu shabu shabu shabu shabu! I read once that shabu shabu – well, any sort of Asian hot pot dish – can be traced back to Genghis Khan, who wanted his soldiers to eat quick but healthy meals on the march, and had them cook it in their upturned helmets. I’m not sure if that’s at all true, but on our last night in Tokyo, Niles and Sam and I had some very delicious shabu shabu, cooked on an electric tabletop grill. It was delicious AND fun. The vegetables in the boiling water end up making a delicious little broth, and the thin slices of beef cook up in seconds. I was addicted to the restaurant’s ponzu, and I ended up dipping everything in it, from bites of rice to the beef and pork, to the mushrooms and sprouts I snatched out of the rapidly boiling water. Apparently, the name “shabu shabu” means “swish swish”, the sound of swishing your meat back and forth in the boiling water. Shabu shabu’s one of the few things that I’m not entirely sure if we can find in Chicago, although Yelp looks like there are a few places that offer it. It wouldn’t be that hard to make on my own, except you’d need a tabletop grill, or maybe just a hot plate? Okay, NOW this might be the last comic I post about our Tokyo trip! I might be done with Tokyo comics, I’m not quite sure yet. But in the meantime, here’s what’s been going on. Mostly, Niles got minor surgery, which kind of freaked both of us out, even though it was a monumentally common and routine kind of procedure, and he’s actually doing really well and recovering super quickly. Which makes the three or four dozen anxiety cranes that are strewn about my house and office seem kind of silly, at this point. I’m working hard to get all the Kickstarter rewards sent out, and in my copious spare time I have decided to pick up a new video game, and also a 1000-page book, for some reason. Times are strange, for sure. But the dust should settle soon, and then we can get back to whatever normal is. Ok! Now I will shut up about the Ramen Museum. Except it was really awesome, you guys!! We had tonkotsu, and then we tried a miso ramen. We got half orders both times, but two half-sized bowls was more than enough to fill my belly and then some. So that’s seven ramen restaurants that I never got to try, which just means that someday I’ll have to go back to Shin-Yokohama and try the rest. Fortunately for me, the Ramen Museum had brochures in lots of different languages, including English. So while I couldn’t read the exhibits or figure out the menus or anything on my own, at the very least I could be of some use deciphering the level map. It was hard to figure out where to start with NINE distinct ramen restaurants at our disposal (and a bar!) but we settled on a tonkotsu place from Tokyo. I’ve had miso, shoyu, and tonkotsu ramen now, and tonkotsu is probably my favorite, with miso running a close second. I’ve never had the shio (salt) base ramen before. It doesn’t sound as appetizing as the others, but on the other hand, I probably wouldn’t turn down a bowl of it either. Just a little bit more of the ramen museum to go, and then I’ll move on, I promise. Let’s go to the lower level of the Shinyokohama Ramen Museum, where they’ve basically taken three levels of basement and turned it into a meticulous recreation of a block of Tokyo from Showa era 33 (1958), which was the year they invented instant noodles. There are movie posters, actors playing policemen and street vendors, fortune tellers, and, among other things, NINE ramen restaurants. The restaurants are all small versions of famous ramen restaurants from all over Japan, highlighting regional specialties and ingredients. It’s AMAZING. SUGOI. I’ll try to get into a little more detail about it in the next comic. Sorry for skipping the comic on Friday, you guys. It’s a little bit of a long story – Niles got minor surgery (he’s fine) – but it was just a really long and emotionally exhausting day and I just didn’t have it in me to do a comic. To make up for it, I did a bunch of anxiety-driven comics while hanging out in the family surgery waiting area, and I put them up here. The first floor of the Ramen Museum is pretty awesome, very educational. Unfortunately, almost none of it was in English, and I didn’t want to make Sam and Yuka translate every single panel for me. There were enough things I could understand, though, things about regional specialties and ingredients, about the first ramen vendors, things like that. But the first floor of the Ramen Museum is pretty small – for a moment I was disappointed, and then I realized we had only paid 300 yen to get in, and it was certainly worth 300 yen, after all – and then Yuka said, “Now we go downstairs.” Oh, right! There was some kind of food court downstairs, that much I had gathered. But “food court” doesn’t really begin to describe what was waiting for us. To be continued! Kamakura was wonderful. There’s a gorgeous shrine and breathtaking bamboo forest where you can sit and drink traditional matcha, there’s an amazing giant Buddha statue that you can visit and even go inside, and there’s a huge, fun shopping arcade with fascinating shops. And Sam pointed out a little ice cream shop that President Obama apparently visited a few years back, and so now their Matcha ice cream cone is called “Obamatcha”! It was freezing and raining while we were there, but we just had to eat some Obamatcha ice cream. Anyway – over the next few strips, I’m going to try my best to describe for you the awesomeness of the Ramen Museum, but I fear it’s going to fall short of the museum’s actual awesomeness. I’ll do my best! So, criminy. 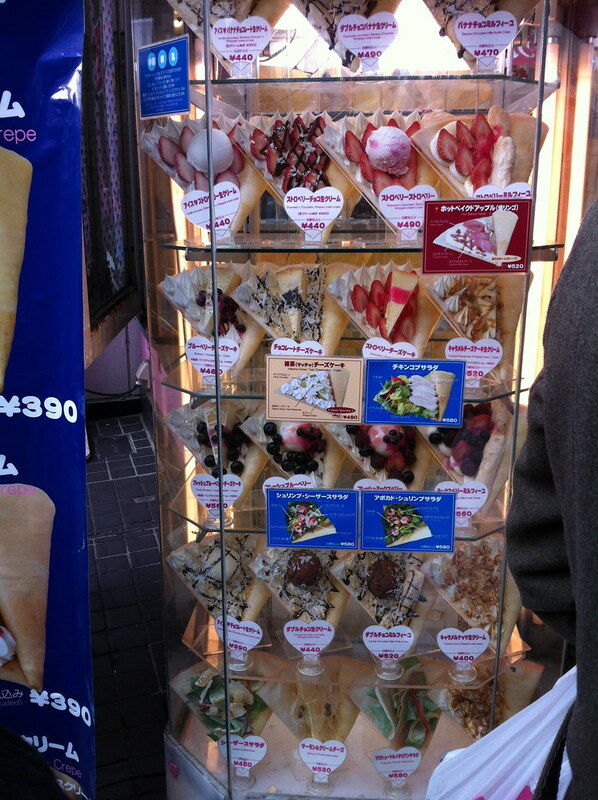 What Harajuku calls “crepes” is something else entirely. I mean, a crepe is involved, sure. Check it out. These things are filled with copious amounts of whipped cream, strawberry slices, entire scoops of ice cream, slices of cheesecake… even down at the bottom of that case, some are filled with Caesar salad or dried salmon. Niles and I split one with green tea cheesecake in it – it was just as sweet and rich and decadent as it sounds. I could never have eaten an entire one on my own, but oh man, am I ever happy we got to try one! One more reminder! Tomorrow, Saturday February 11th is the release party for my new graphic novel, Shuteye! Come on by, I’ll be signing books and selling prints and stuff, it’ll be great! Also there will be booze! They were all great, but I think my favorite was the Iwatekura Oyster Stout. As it happens, oyster stouts aren’t all THAT unusual. It was delicious, not overly shellfishy, but it was dark and sweet with a warm, slightly salty edge to it. Augh, I miss Tokyo so much already, you guys. But I think drinking all the dark beers I want would probably bankrupt me there. Maybe we don’t have heated coffee in cans in vending machines here, but at least I can afford all the stouts and porters I want. In Tokyo, Sam took us to a number of different salaryman hangouts; these dishes are from a few different places. If you’re unfamiliar with the term, “salaryman” pretty much just refers to a white-collar worker in Japan – the stereotype is that they work long, punishing days, and so when they unwind, they unwind like CRAZY. We saw a number of be-suited guys so drunk that they were staggering uncontrollably on the road, or falling down stairs. And on the night that we ate most of these things, we actually witnessed a bar fight! It never came to blows, but these two salarymen were just screaming at each other, until one chased the other one out, with the bar’s mama-san trotting after them, trying to keep them apart from one another. Anyway! Japanese potato salad is not far off what Americans call potato salad, and if you’ve ever been to a Thai or Japanese restaurant, you’ve probably had gyoza. The pig’s tongue was good, it tasted just like a hard sausage, and the smoked cheddar was good, if unremakable (except for how much it looked like caramels in the plastic wrappers). I’m a super big fan of octopus, so of course I adored both the fried and the wasabi-grilled octopods. They were tender, delectable, perfectly salty bar snacks. The oden of course was the standout – I’d never had it before. It’s a warm, brothy winter stew with tons of various delicious things in it. Ours had boiled egg, mushrooms, tofu, fish-cake, daikon, and lots of other stuff in it. In other news!!! Guys! The Shuteye book is almost here! We’re having a big release party for it this coming Saturday, at Challengers Comics + Conversation. You should come! I’ll be talking about the book a little, and signing them, and if you contributed to the Kickstarter fund you can pick up your rewards there (just make sure to let me know you’re coming, if that’s the case). Also there will be beer and wine, and copious high-fives!